Battered pieces of chicken breast with a chilli barbecue sauce. Battered chicken breast pieces in BBQ sauce with mirin rice wine. 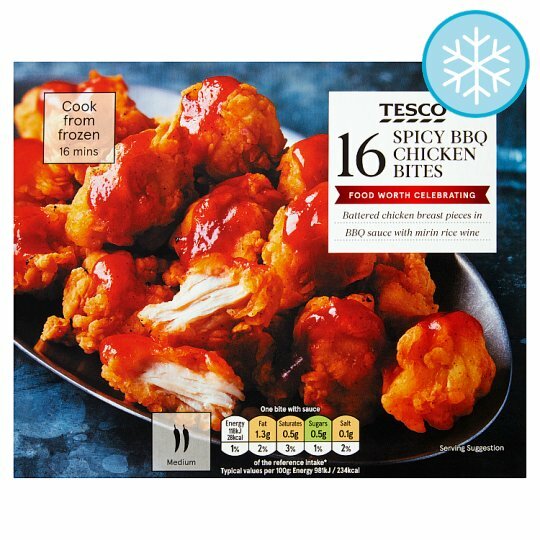 16 Chicken Bites: Chicken (59%), Wheat Flour, Palm Oil, Water, Tapioca Starch, Wheat Starch, Salt, Garlic Powder, White Pepper, Raising Agents (Sodium Bicarbonate, Calcium Phosphate, Disodium Diphosphate), Wheat Gluten, Sugar, Chilli, Black Pepper, Dried Skimmed Milk, Colour (Paprika Extract), Sunflower Oil. Spicy BBQ Chilli Sauce: Water, Sugar, Mirin Rice Wine, Cornflour, Garlic, Glucose Syrup, Sucrose, Soya Bean, Wheat Flour, Apple Purée, Salt, Chilli, Onion, Paprika, Pepper, Dextrin, Rice Vinegar, Colour (Paprika Extract), Yeast Extract. Instructions: From frozen: 190°C/Fan 170°C/Gas 5 16 mins For best results cook from frozen. Remove all packaging and sauce. Place chicken bites on a baking tray in the centre of a pre-heated oven for 12 minutes. Drizzle over the sauce and heat for a further 4 minutes.